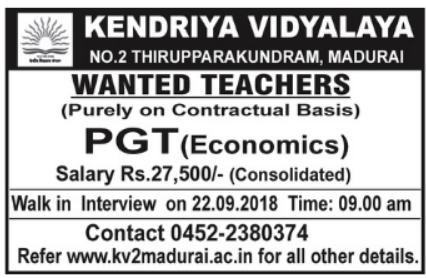 Kendriya Vidyalaya, Madurai has advertised in DINAMALAR newspaper for recruitment of Teachers PGT jobs vacancies. Interested and eligible job aspirants are requested to walk-in on 22nd Sept 2018. Check out further more details below. About School: Kendriya Vidyalaya No.1 Narimedu,madurai Belongs to Kendriya Vidyalaya Sangathan, New Delhi an autonomous body, under the ministry of Human Resource Development, Government of India. Affiliated with the Central Board of Secondary Education, New Delhi. Medium of instruction-English / Hindi. Established in 1966,the Vidyalaya is in the prime location of the city. Upgraded as a four Section School in 2006. How to Apply: Interested and eligible candidates are requested to attend the Walk-in interview along with CV, originals & copies of certificates and recent PP size photos to the walk-in address mentioned below.